Congratulations to our Client Kevel for their feature on Red Tricycle! Oppressive waistband. A case of mysteriously shrunken pants or the expansion of a belly can over-cinch to the point of pinch. Wear your pants with the confidence that a Kevel Perfect Fit has your back by holding up your front. By expanding your waistline and securing your zipper, kevel Perfect Fit preserves you favorite pants when your body says go a size up. Kevel is a little elastic tie that fits in the palm of your hand. It allows you to wear your jeans unbuttoned (and even slightly unzipped) by anchoring the zipper handle to the button. 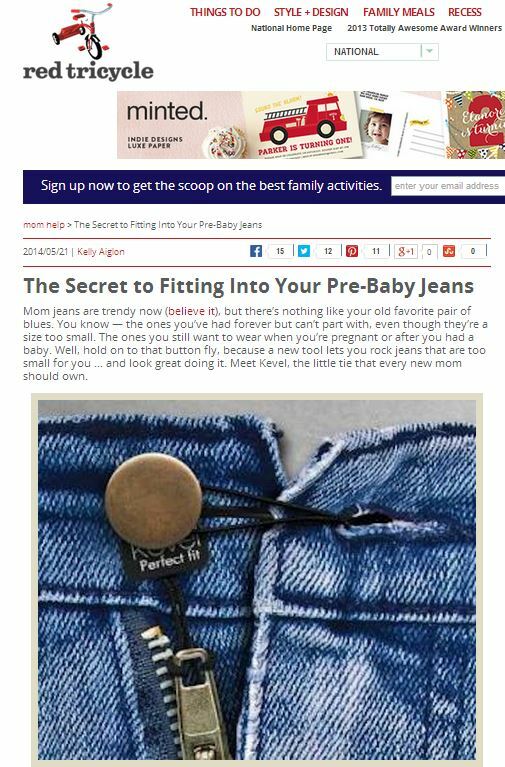 Mom, Rachel Kearl, invented it when she was trying toÂ preserve a favorite pair of jeans. She worked on a fix for the faulty fly and usedÂ a modified hair band as the first prototype. Itâ€™s easy to attach: Just insert the non-elastic string through your zipper handle hole and anchor the rubber piece to your button. Then loop the elastic string through the button hole and pull it back and over the button. It works like a charm. Check them out at kevel.com!